How did you hear about CAP -CDM Mike? In easy reach of Dortmund, there’s lots of choice: Bochum, ‘Gladbach, Koeln, Paderborn, Wuppertal, Duisburg etc. BUT the daddy for beer and atmosphere, up there with BVB, is Fortuna Duesseldorf. Happy travels. if you want to enjoy a good atmosphere, I recommend you Fortuna Düsseldorf, Dynamo Dresden (be careful here, they don’t like britishmen since you bombed them (West Ham sadly knows that)) and Eintracht Frankfurt. You should visit a Scania Derby (Malmö FF vs Helsingborgs IF). If you want a Scandinavian hate filled derby. I have been thinking about doing a Swedish game actually! When is the next one? I should rather/also go to the Twin Derby (both clubs formed in the year 1891 within a month) between the Stockholm clubs Djurgården and AIK. By far the most fervent game in Sweden and probably in the Nordics as well. The Scania derby is a good one too with great supporters from the Malmö side at least, but you do not get the same athmosphere as you get at Tele2 Arena (Djurgården) or Friends Arena (AIK) where you have two equally big singning supporter following. It’s truly amazing! I overheard a Brittish journalist during the last Twin Derby and he was amazed. I really like your blog 🙂 Great idea! I’m a MA Journalism student, writing a feature on the rising price of season tickets. I would really like to talk about your project/your views on season ticket prices. The atmosphere I experienced at the ESPRIT Arena in Düsseldorf is the best atmosphere I have experienced in European football, aside from Hibs vs Hearts in my local Edinburgh derby and Hibs vs Celtic in the Scottish Cup Final. You should definitely try coming to Scotland and watching First Division, or even Third Division as the atmosphere is just as good! Interesting, I’ll definitely look in to this. Where can I find fixtures, and is there a particularly big game? Hi Ben,I as just going to suggest a league of ireland game 😀 Im a cork city fc supporter myself,our first game of the new season is on the 7th of march 2014 at home to st.patricks athletic, we have a new manager in place and some decent signings too,as mentioned by crazygang88 cork city fc are a fan owned club,like quite alot of the clubs over here,we may not have huge pyro displays or tens of thousands of supporters but i can guarantee you that a trip to a league of ireland game is a great evening out. If you have any questions about this fixture or league of ireland in general,drop me a line by email. Anyone wanting to go to CAP Ciudad de Murcia let me know and i’ll help if needed. Whats a big game for you? (CAP) I am hearing more and more about them, never looked into going until now. is there an e-mail address I could contact you at? With new arenas Brazil is emptying stadiums. Come here! Shamrock Rovers v Bohs (If they manage to not get relegated), the big Dublin derby! Will Murray here – Media development director for Football club magazine. Is it possible to get some contact details? Just read your blog about the Wear – Tyne derby. Very impressed. Would like to talk to you about the chance to feature in our publication. Thanks in advance and keep up the great work. go to Dinamo Zagreb-Hajduk Split in Split and Panathanicos-Olympiacos in Athens and Levski Sofia-CSKA Sofia and Sarajevo-Zljeleznicar in Sarajevo . Agree, but I believe that would be better to look Borac Banja Luka against Sarajevo or Zeleznicar, then the game between those two.. Much more tension and madness..
Hey, Ben! First, I’d like to let you know I really appreciate what you do, you’re really great! It would be really great if you would come to an Petrolul Ploiesti derby! Panathinaikos against Olympiakos is more than mental choice to make.You must no doubt watch that all time classic fixture! Have you considered visiting Bosnia and Herzegovina? Maybe you have heard for the “Sarajevo” derby, but i would say the biggest derby is between Zrinjski and Velež. Its not only a local derby, but a derby between a Croatia(catholic) and a Bosnian(muslim) club and its really great! Its packed with high tensions and followed by a great atmosphere and ultras performances. I suggest you to visit Feyenoord-Ajax ones. Its a really great atmosfere in DeKuip homeground of Feyenoord. The only reason to wait for this match is the ban of the ajax supporters in de Kuip and the ban of Feyenoord Supporters in the Arena, homeground of Ajax (020 for feyenoord fans). This ban is already for a couple years and every year is there a new option to cancel this ban. 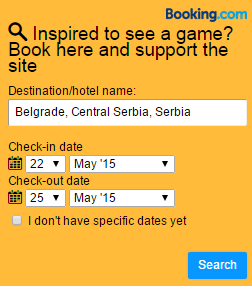 How do you get tickets for the Belgrade derby please? Great threads though I think I have read every match report tonight, well written. Great work. Having just returned from another game at 1.FC Union Berlin I can thoroughly recommend a game at the alte forsterei.. Its clear the fans love their club and are proud of them whatever the result. The real Berlin derby is Union-dynamo a throwback to the DDR_stasi days. Yeah you should probably watch the derby between Hammarby-Djurgården 13 april to get a fair picture of the fans in sweden, to claim Djurgården to be the best, is just plain wrong. Celtic have more fans (people who travel to matches) not only buy tops – than Sunderland, Leeds and Chelsea combined. If you want to experience something inspiring go see Celtic away against a big European team – Spanish, Italian, French, German or English. Do you have any plans for a sheffield derby someday? Would love to do that one, just need Sheffield United to get their act together and win the playoffs! Hi there mate, quality page, very inspirational. Panathanaikos v Olympiakos is a must if you haven’t already, atmosphere is fierce. Check out the copenhagen derby (brøndby if vs. Fc københavn), there are 3 of them every season in the main league. I see you have already seen my team (brondby), home against sonderjyske. That was just a regular game against a small team without real ultras, so the that is not to compare with the derbys at any point.The atmosphere at a copenhagen derby is always mind blowing, no mather how many points seperating the two teams in the league (mostly they are figting very close over the #1 spot, but brondby has been in an out of crisis the past 10 years, but still increased in numbers of supporters, and no lack of atmosphere). You can check out some videos from the past, the pyro is reaching a insane level, especially when you consider the high level of security from police and guards at these games. The best thing tho, is deffently the tifos, from both sides. I have never seen tifos outside of denmark that was greater than the tifos from the copenhagen derbys the last 4-5 years. You problably already have seen them, since they have been shared in the hole world. Btw: both BIF and FCK have a very big amount of ultras in a scandinavian perspective, and they are both very close connected to the swedish ultra scene, and some of the clubs support each other. So think about it, and if you decide to go watch it when brondby is playing at home, let me now and ill hook you up with everything you need transport, hotel, ticket to the right section, places to meet, info on planned tifos and sarbotage of the enemys support ;), and everything else. Keep up the good work, this page is awesome ! Are tickets easy to come by? I was looking at doing this derby in February next year. The scene for danish ultras from an English perspective has definitely rocketed. I want to tuck this derby off the list. The above comment is in reply to Peter above about the Brondby derby. Some reason it didn’t reply to your comment. Hey Ben, have a question. I will be going to feyenoord-zwolle on November 20th, and just wanted some advice on what section I should buy tickets in, what I should know before buying tickets, and other general info. I’ve heard a lot about the atmosphere at De kuip and can’t wait to experience it for myself. Other teams whose atmosphere I’d be interested in hearing your opinions on would be Marseille, Napoli (the San Paolo shakes to its foundations on big nights! ), Sevilla, Aris (who brought undoubtedly the best away support England has ever seen to Man City in the Europa League a few years back), and Salernitana (a club which had only ever been in Serie A for one season in its history but which has an incredible curva and ultras). I’d have loved to hear about the Croatia derby but it seems attendances have fallen way down, maybe because of the corruption of Croatian football.